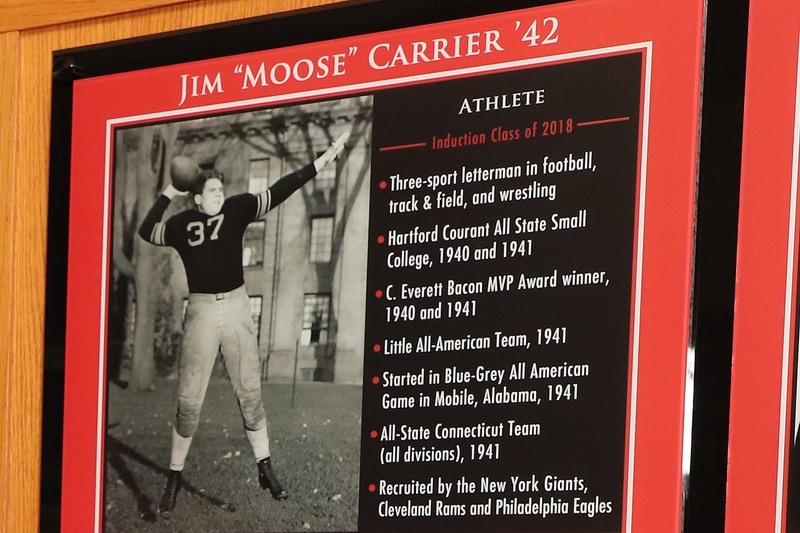 James Carrier ’42 (football, track and field, wrestling) was inducted posthumously. He was a three-sport athlete at Wesleyan who competed in football, track, and wrestling. He excelled in football and was named a team captain during his junior and senior seasons. Carrier started all 24 games during his four-year career and led the football team to a Little Three Championship in 1939. He rushed for 12 career touchdowns, passed for 22, converted 35 points-after-touchdowns (PATs), and scored or contributed to 242 points during his career as a Cardinal. Carrier also starred in the New Year’s Collegiate Football Classic in Mobile, Alabama, in 1942. 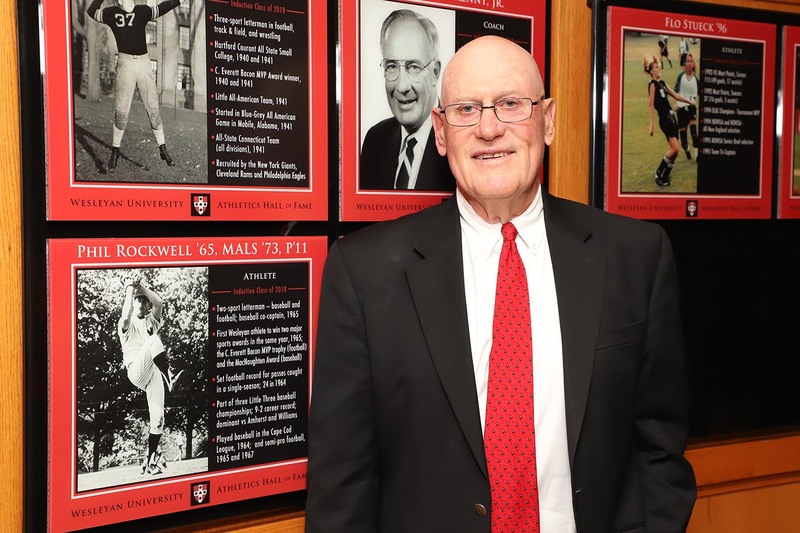 Philip Rockwell ’65, MALS ’73, P’11 (football/baseball) was the first Wesleyan athlete to earn both the C. Everett Bacon Football Trophy and the Walter MacNaughten Memorial Baseball Award. In 1965, he held the program single-season record for receptions, hauling in 24 as a tight end. He was named an All–New England Honorable Mention. Following his collegiate career, Rockwell played semipro football and also competed in baseball’s Cape Cod League. 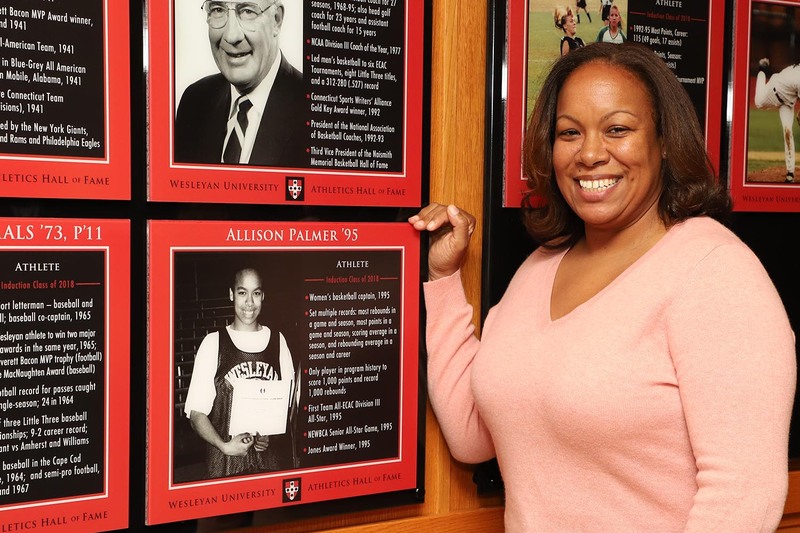 Allison Palmer ’95 (basketball) had a decorated career at Wesleyan with the women’s basketball team. She is the program’s all-time leader in rebounds (1,001) and rebounding average (11.12). She also holds the single-season records for scoring average (21.2), points (488), rebounds (310), and rebounding average (13.5), and single-game records for points (35; tied with two others) and rebounds (28). Palmer is also the only Cardinal in women’s basketball history to score 1,000 points and grab 1,000 rebounds in their career. She was named a First Team All-ECAC selection as a senior. 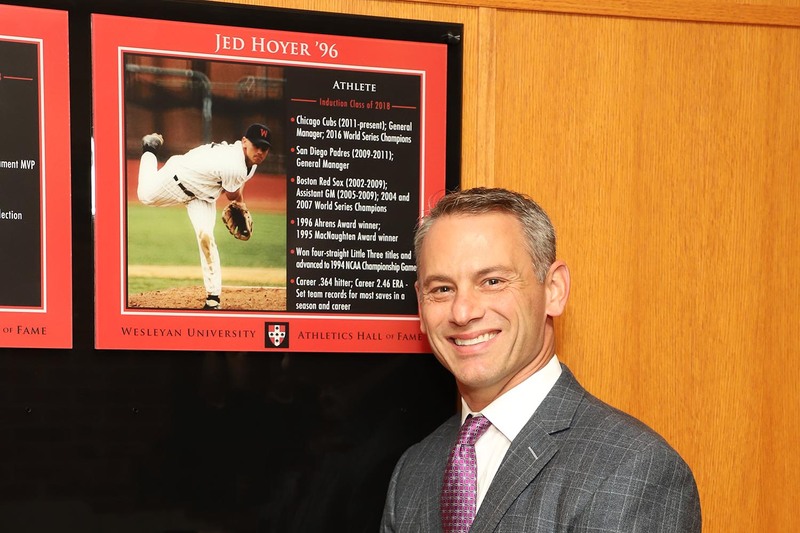 Jed Hoyer ’96 (baseball) had an outstanding baseball career, highlighted by being a standout at four different unique positions. As a hitter, he had a career .364 batting average, including batting .424 his junior year, while also being an excellent defender at shortstop, left field, and even at catcher. As a pitcher, he was on the mound as a closer when Wesleyan won the New England NCAA Regional and was also a starting pitcher who had a career 2.46 ERA, a record of 7–1, and 11 career saves, including 7 in his senior year. Incredibly, he started and was the winning pitcher in both games of a doubleheader against Williams in his junior year. His Cardinal teams won four-straight Little Three titles and advanced to the national championship game of the 1994 NCAA World Series. He won the MacNaughten Award for excellence in baseball as a junior and also played in the prestigious Cape Cod League. Hoyer was an assistant general manager for the Boston Red Sox in 2004 when they won their first World Series title in 86 years. They also won again in 2007, and soon after, he spent two years as the general manager for the San Diego Padres. His next stop was as general manager of the Chicago Cubs, and in 2016, they won the World Series for the first time in 108 years. Flo Stueck ’96 (soccer) was the most prolific scorer in Wesleyan women’s soccer history and holds almost every scoring record—most goals in a career (49), season (16), and game (4; tied with two others), and most points in a career (115) and season (37). A captain her senior season, Stueck concluded her career with several accolades. She was named to the 1995 NEWISA Senior Bowl, was a Division III All–New England selection, was named the 1994 MVP of the ECAC Championships, was selected to the NEWISA All-Star Team and earned an All-Star selection by NSCAA/Umbro. Stueck was also a member of the 1994 women’s soccer team that was inducted into the Hall of Fame in 2016. Herb Kenny (coach) served as head coach of the Wesleyan men’s basketball team for 27 years (1968–95) and compiled an impressive 312–280 (.527) win-loss record. He coached his teams to six ECAC Tournaments—including three semifinal appearances and one runner-up finish—and shared or won eight Little Three titles. His teams also won the Schoenfield Sportsmanship Award five times, and in 1977, Kenny was named the NCAA Division III Coach of the Year. Acclaimed across the country as one of basketball’s most valued and influential ambassadors, he became the first Division III coach to be named president of the National Association of Basketball Coaches (NABC) in 1992–93. 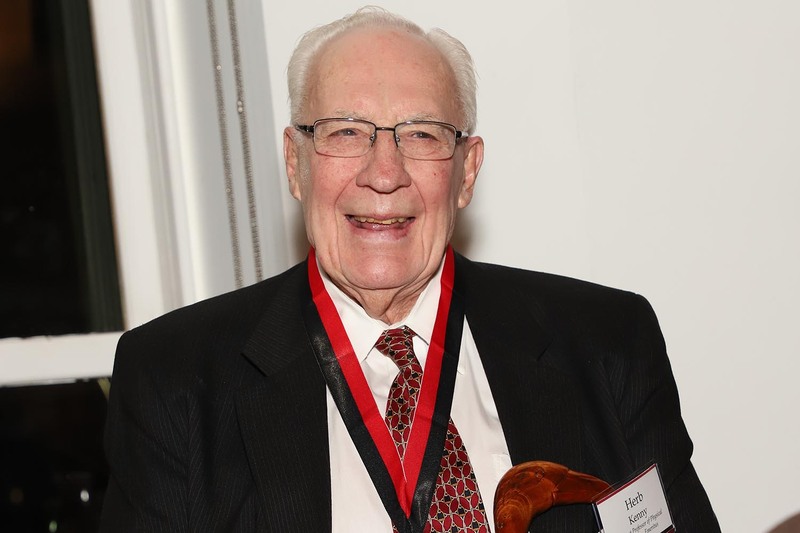 He was also chair of the NABC’s Division III Rules Committee, a member of the Academic Committee, third vice president of the Naismith Memorial Basketball Hall of Fame, and director of USA Basketball. Additionally, Kenny was named the 1982 New England College Basketball ll Coaches’ Association Alvin “Doggie” Julian Award winner, which is presented for outstanding service to New England college basketball, and in 1992 he received the Connecticut Sports Writers’ Alliance Gold Key award. While at Wesleyan, Kenny also served as the golf head coach for 23 years and was an assistant football coach for 15.